What Are the Telltale Signs of Someone Counting Cards at a Casino Table? What are telltale signs of card counting at a casino table? : originally appeared on Quora: The best answer to any question. Ask a question, get a great answer. Learn from experts and access insider knowledge. You can follow Quora on Twitter, Facebook, and Google+. In blackjack, if you count cards, it's very easy to tell if other players are counting. Counting cards changes your play style in certain ways. You will tend to bet high when the "count" is high, and bet lower when the "count" is lower. Even with different counting systems, counting always points in the same direction. If someone is betting high when the count is high and lowering the bet when it drops, then perhaps he or she is counting. Is the person sitting out when you are sitting out? Might be a counter as well. To a counter there are some clear signs. This is why many casinos hire former counters to detect and confirm counters. If you are not counting cards, there are still many ways to check if someone is counting. If someone bets on average much more towards the end of the shoe than in the beginning, then this is a positive sign that someone is counting (but in no way conclusive). Counters do this sometimes because that's when the true count is potentially the highest. A high true count indicates a high player win rate. Another way to detect a counter is by seeing bet increases when a number of lower value cards come out and are played. Again, this is in no way conclusive but it is also a positive sign someone is counting. You don't have to keep a count yourself to notice this behavior. There are some other plays that are red flags. The first red flag is splitting 10's. 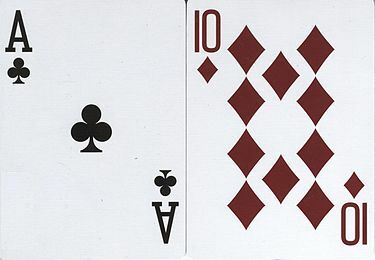 It is a no-no in blackjack to split 10's. Many blackjack players say only dumb people and card counters would ever split 10's. If someone split 10's and is mostly following basic strategy this is very suspicious, especially with a large bet on the table. A lot of advantage players don't do this anymore, even though it does bring in a bit of advantage. Taking insurance in blackjack when they have a high bet is also a possible sign of card counting. Basic strategy says never to take insurance. Most people that do take insurance do it when their hand is good (but really insurance means do you think the dealer has blackjack and should never rely on your own hand). Insurance is the single most important play that is outside normal plays that card counters will use. This is why counters still take insurance even if it gives off a possible red flag. All casino personnel are trained somewhat to recognize suspicious plays. They are on the lookout for people that bet more at the end of the shoe, and then go back to the minimum bet at the beginning of the shoe. They also look out for people that play 2 hands sometimes or play big bets only sometimes. They watch people that bet high sometimes whether or not they are winning or not. Surrendering 15 sometimes vs a 10 is a sign of card counting (basic strategy says to do it always). Making a play like standing 16 vs 10 sometimes is also one. The key is consistency. If someone isn't consistent with some strategy either they are beginners and don't know basic strategy, or they are counting and using basic strategy variations. Standing 12v2 at a higher bet but hitting at lower bets is another example of a basic strategy variation. Hitting 12v4 around half the time is another example. I personally start paying attention to people's play when I see them playing good basic strategy. Unfortunately, this is rare. Playing good perfect strategy includes surrendering properly, and doing a few trickier correct moves (like doubling correct soft hands). This led to noticing a number of counters at casinos. They raise bets when I raise, and then lower bets when I lower them. One guy I am certain was a counter asked the dealer who was going to switch out to play 1 more hand (when the dealers switch out of some pitch games, they drop the shoe). The guy proceeded to spread his bet to 2 hands and the running count was about 10 in a double deck with maybe a little over a deck left to play (which is a large advantage for the player). The same guy also ramped his bet up from $25 to $250 fairly quickly in the previous shoe which was also really high count. What was more telling was he smiled at me and left right after the dealer played an extra hand and said "well looks like one of us has to leave". It is bad for 2 counters to play at the same table and he knew that. Maybe if the guy disguised his greedy play better, it wouldn't have been as clear, but that was probably the most clear cut example of a counter that I have personally encountered. A common misconception is that a card counter always wins. They don't always win. They are expected to win in the long run, but even while counting winning is nearly 50/50. The advantage gained from counting is around 1-2%. Casinos: How do casino's avoid card counters? Card Counting: How do casino's avoid card counters? Poker: What is it like to earn a living through poker?